Most pleasure trips start with a feeling or a mood for something new and different. The need for a break from your routine, a desire to visit somewhere on your bucket list, a rejuvenation and renewal stint at a destination spa, a theater themed, long weekend in London or New York, or an once-in-an-lifetime African Safari are all ideas that begin to take shape when you are getting that travel bug again. After deciding to take a trip and knowing how long you're able to get away, the next hurdle you have to jump over is determining if you can afford to go. Developing a trip budget will help you answer this question. Few people I know enjoy budgeting but those who do know the benefits. Building an estimated trip budget will reveal if you need to save extra money to take the trip, how much your most expensive costs, lodging and airfare, will be, plus force you to determine an approximated cost for food and your must do activities. You will also know what your pre-trip costs, which add up, will be. Having a good idea of the cost of your planned excursion and properly preparing for it lays the foundation for a great solo getaway. 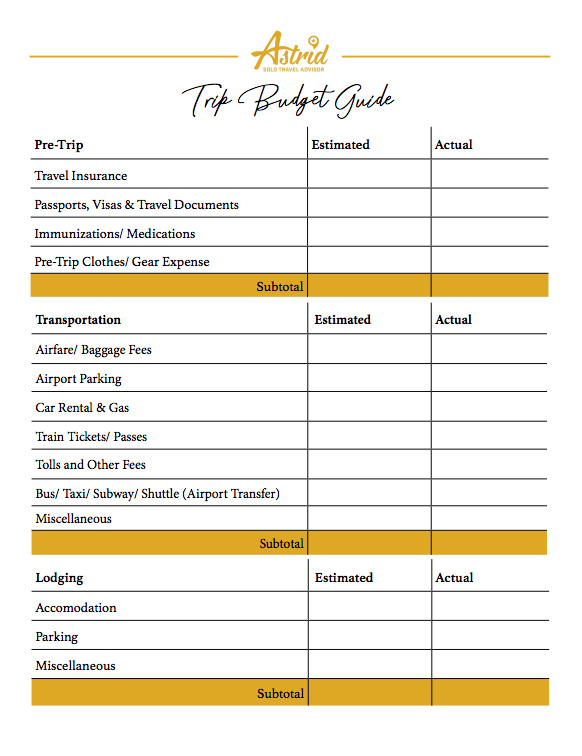 Featured above is the simple budget guide I use to estimate the cost of a potential trip. Once I've completed this guide, I put my game plan together on how I'm going to make this dream happen. Likewise, I continue to research different travel sites to determine if money can be saved in any of the cost areas. Depending on the amount needed, I decide if I want to start breaking up the cost several months before I leave by paying a portion of the lodging, airfare, and pre-trip expense each month. Thus, the bulk of the trip's cost is paid for before I leave home. The remainder of the costs are from the food, activities, shopping and emergency fund categories all of which can be modified while on the trip. Accordingly, I always track how much I'm spending day to day on each trip. An app such as Trail Wallet is a great way to do so, with options to track expenses by category, see total spent, and remaining trip budget. How Much Does It Cost to Take an “Affordable Luxury” Trip? Research shows that most luxury solo travelers spend approximately $5,000 per trip and they take up to four trips per year. Four to five day weekend trips are favored over longer trips with three weeks being the length most travelers won't go over when leaving home. 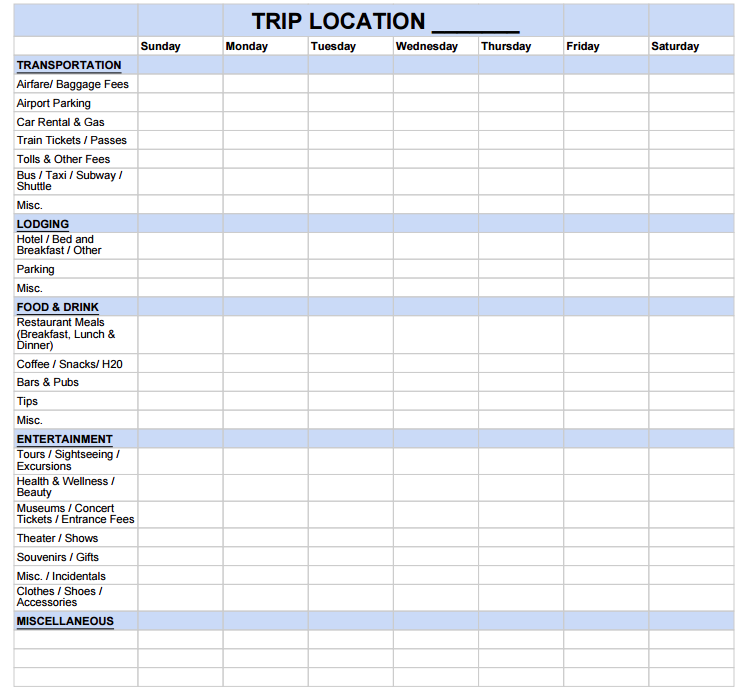 Typically, my trip daily cost ranges from $250 to $750 per day. My limit is $1,000 per day. Any more than this I feel is wasteful and I won't top this amount unless it is an "uber" experience or a "to die for" item to buy. Many factors affect your daily total expenses. Some include the currency conversion rate, the base cost of luxury four or five star hotels, business class airline tickets (which I purchase if the flight is longer than five hours), tourist and attraction premiums as well as, my weakness, shopping. Like most people, if I plan to do some serious shopping, I try and shave off some of the other costs. I plan to walk more, maybe eat less, and/or stay in a less expensive luxury hotel that is still well located and safe. Daily, I keep up with my cost-per-day to help me control my impulse spending. If I decide to splurge on something, I will know I have to either not do certain planned things or cut something out to prevent credit card shock when I get home. My routine is I save the day's receipts and plug the numbers into my daily trip expense sheet. I total each day's expenses and keep a running total on how much I am spending. Before I leave I know what my approximate daily costs should be and if I have gone over the budgeted amount one day I will pull back the next day or two to get this figure in line with my target cost. The following is the daily budget expense sheet I use when traveling. While on the return flight if I'm not too tired or definitely after I get home, I do a post-trip budget recap by totaling up all of the actual expenses against the estimated costs. Even though I don't really like budgeting, I do love to see if I achieved the money goals I set for my trip. It's a great feeling to get those post-trip credit card bills and they are approximately the amounts you have already planned and budgeted for. My passions for luxury travel and finding reasonable or bargain prices for this type of travel are two of the catalysis that led to the development of this website. Ironically, the dreaded trip budgeting process has refined my cost saving travel skills and is some of the substantive focus of Astrid Solo Travel Advisor’s content foundation. If you incorporate this guide into your trip planning process, you should have the peace of mind knowing you can afford your solo adventure. "Solo travel within your means," is the endgame and a fundamental key to a Great trip versus an OK trip. Take the time to budget; you'll be glad you did.